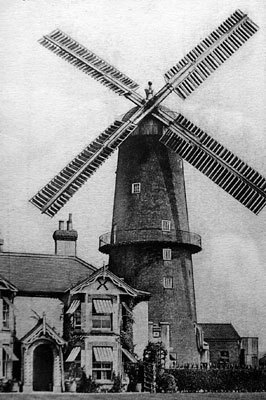 Watlington towermill was a large mill that stood in Mill Road near to the site of an earlier postmill. The four double shuttered patent sails, were 9 feet wide with a span of 91 feet. Each had 9 bays of 3 shutters and 1 bay of 2 shutters. The 8 storey mill had an ogee cap that was vertically boarded to form a petticoat and it had a ball finial, a 6 bladed fan and a gallery. A stage was set around the 4th floor. WANTED, a Married Man in the above business; one who has been used to a Country Trade preferred. Must be a good hand and well recommended. Apply Mr. Edward Crow, Watlington Mills, Downham. WANTED, a strong active Married Man to work a TOWER MILL. Also a Married Man as CARTER, one who can write. References required. Apply Edmund Crowe, Watlington, Downham. WANTED, an IMPROVER in the above business. Apply to Mr. Edmd. Crowe, Watlington, Downham Market. It having been reported that, in consequence of my hiring a Farm, I am about to relinquish my business of a Miller and Baker, I beg to inform my numerous friends and patrons that such is not the fact and I shall, under any circumstances, continue to carry on my said business as heretofore and all future orders shall have my best attention. 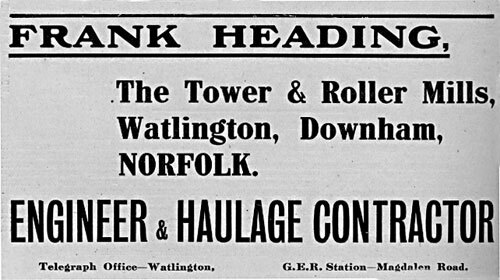 All letters referring to the Milling and Baking business to be addressed to Mr. William Smith, Watlington, Downham, Norfolk. After leaving Watlington mill, Edmund Crowe farmed at Denver but still owned the mill. WANTED, a Married Man not more than 30 years of age in the above Business, one who has been accustomed to Windmills. Constant employment. Reference required. Apply Mr. Crowe, Denver, Downham Market, Norfolk. WANTED, a steady active young man as IMPROVER in the above business. Apply Mr. Crowe, Denver, Downham Market. WANTED, a JOURNEYMAN, also an IMPROVER in the above business. Wanted , a single man in the above business. References required. WANTED, a Single Man as JOURNEYMAN. Also an APPRENTICE in the above Business. Apply Mr. E. Crowe, Denver, Downham Market, Norfolk. WANTED, an APPRENTICE to the Milling and Baking Business, to board in the house. Apply Mr. Wm. Smith, Mr. E. Crowe's, Watlington Mill, Downham. WANTED, a Young Man as IMPROVER in the Milling and Baking Business. Also a YARDMAN and TEAMMAN. Reference required. WANTED, an IMPROVER in the above business; also a BAKER as second hand. Apply Mr. E. Crowe, Denver, Downham Market. WANTED, a Journeyman MILLER. One who has some knowledge of the Baking would be preferred. Apply to Mr. E. Crowe, Watlington, Downham Market. Notice re above who died 8th February. WANTED, a MAN who thoroughly understands his business and who has been accustomed to Wind Mills. References required. 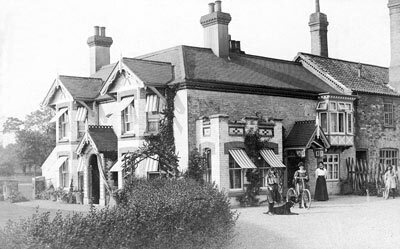 EDMUND CROWE returns his grateful thanks to the inhabitants of Watlington and its neighbourhood for the kind and liberal support he has received from them during the last nineteen years; and having disposed of his business at Watlington to Mr. Alfred Turner, for some years the Manager of his Milling Business, he has great pleasure in recommending Mr. Turner to his customers. ALFRED TURNER in soliciting a continuance of the support so long given to his predecessor, pledges himself to supply good articles at reasonable prices and hopes thereby and with civility, to retain the confidence of Mr. Crowe's customers. Debts due to the said Edmund Crowe will be received by the said Alfred Turner. Wanted, a MAN who understands his business. A married man preferred. Apply to A. Turner, Watlington Mills. Wanted a MAN in the above Trade. One who has a good knowledge of the trade. A Married Man preferred. 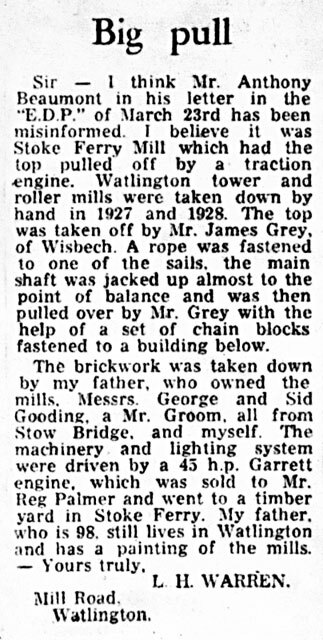 Apply to A. T., Watlington Mill, Downham Market. Watlington Mill, December 27, 1872. Wanted, a man who has been accustomed to a wind mill. Good references required. A married man preferred. Apply A. T., Watlington Mills, Downham. WANTED, a MARRIED MAN well acquainted with a Wind-mill. Liberal wages given. Apply A. Turner, Watlington Mills, Dunham. Wanted, a MARRIED MAN to work a windmill. 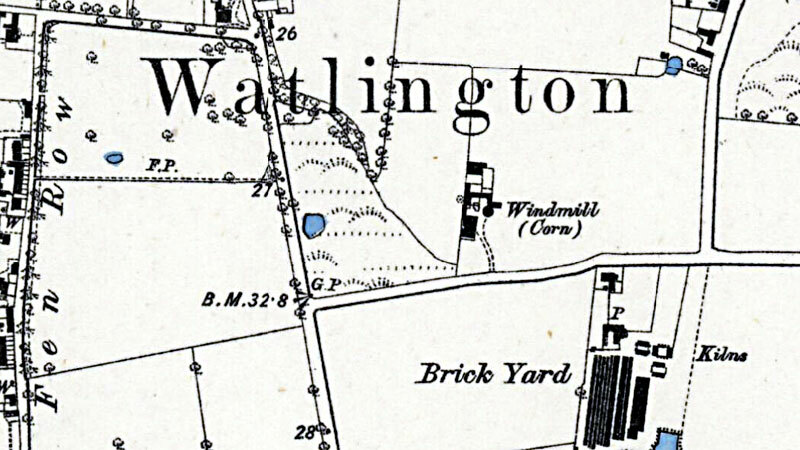 Address, A. Y. Watlington Mills, Downham. Wanted, a married man, one used to a Wind Mill preferred. Apply to A. A. Turner, Watlington Mill, Downham. Wanted, a Man who has been used to a Wind Mill. Apply to A. Turner, Watlington Mills, Downham. Wanted, a married man as second hand and to drive a cart. Apply to A. A. Turner, Watlington Mills, Downham, Norfolk. Wanted, a man in the above trade. Apply to Mr. A. Turner, Watlington Mills, Downham Market. REQUESTS that LETTERS intended for him be addressed as above as otherwise they are frequently misdelivered. Wanted, a man as Second Hand and to drive a cart. A married man preferred. WANTED, a young man in the above trade, one who has served part of his time preferred. Apply to A. Turner, Watlington Mill, near Lynn. WANTED, a junior hand where two or more are kept; one used to a windmill preferred. Apply to A. A. Turner, Watlington Mill, Downham or Corn Hall on Tuesday. On the 13th inst. aged 54 years Jane, wife of Edmund Crowe of Denver. The Funeral of Mrs. Jane Crowe, wife of Mr. E. Crowe of Denver, took place here on Thursday last. A great many of the inhabitants attended to shew their last respect for the deceased who had resided at Watlington for many years and was very much respected. WANTED, a young man who has served part of his time, where two more are kept. Apply to A. A. Turner, Watlington Mill. WANTED a young man as Second Hand and to go with cart. Character required. Apply to A. A. T. Watlington Mills, Downham. Apply to A. A. Turner, Watlington Mills, Downham. WANTED, a married man that well understands his trade, to work a Windmill. Cottage and garden found; good character required. Apply to A. A. Turner, Watlington Mill, Downham Market. Having taken the above Mills, begs to announce to the public in the vicinity that he intends carrying on the business, in both its branches and hopes by strict attention to all orders and supplying good articles at reasonable prices to merit their future patronage and support. Having given up the Mills, begs to return his best thanks to the residents of the surrounding neighbourhood for their support which he has received for the last 12 years. All communications connected with his late business may be sent to him at his present address, Wolferton, Kings Lynn. WANTED, a steady honest single man as Second Hand in a mill. One used to wind and a knowledge of baking preferred. Apply to F. Heading, Watlington Mills. Sale by Private Contract of Grocer & Draper's shop etc. as in occupation of Mr. Alfred Turner. Workman, Robert Hoare, an employee of Mr. Savage of St. Nicholas' Works killed on Wednesday 12 June by fall of chimney during installation of two new ovens for Mr. Heading. WANTED, a married man as Second Hand in a Wind and Steam Mill. Must be a good stoneman. Apply to F. Heading, Watlington Mills, Downham Market. Wanted, a married or single man as above in a tower wind-mill with steam power attached. Must be a good stoneman. References required. 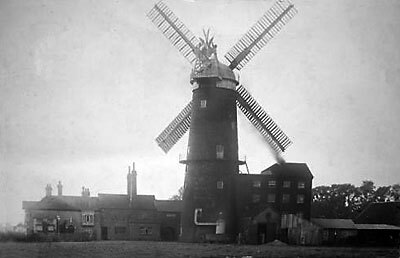 MILLWRIGHTS, one or two competent Men used to windmill work, for a job from 4 to 6 weeks. Apply to Frank Heading, Watlington Mills, Downham.